Per Vivo Labs is excited to announce that Dr. Brent Ruby, Ph.D., FACSM, and a team of scientific researchers at PhysioZing, LLC, recently validated the efficacy of Per Vivo Labs’ Polar Skin™ Comprehensive Cooling System; a revolutionary portable modality for the immediate, on-site treatment of heat-related illnesses. Immediate intervention is imperative. It’s in this space that the Comprehensive Cooling System is essential. 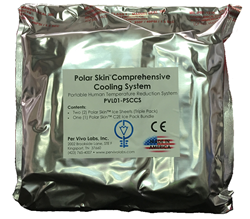 Per Vivo Labs, Inc., is excited to announce that this week a team of scientific researchers, led by Dr. Brent Ruby, Ph.D., FACSM, released the findings from human testing conducted with the Polar Skin Comprehensive Cooling System. The Comprehensive Cooling System is one in a family of products designed and manufactured by Per Vivo Labs for the timely and effective treatment of heat-related illnesses.